If I had to choose my favourite snack of the ‘sugary’ variety, I would have to say that my fingers tend to go for a few slices of chocolate rather than a tub of ice-cream, so when I was offered to try some Ohso Chocolate, I happily said ‘yes’. If you speak to nutritionists or even cardiologists, they will concur that good quality chocolate, particularly its dark variety, is good for you but Ohso has taken the chocolate goodness (it is made from a minimum of 53% cocoa solids) to the next level, with incorporation of Lactobacillus and Bifidobacterium friendly gut bacteria into its bars, thus helping to keep you gut flora and immunity system healthy. The chocolate itself is manufactured in Belgium, a country known for its refined tastes when it comes both cuisine, as well as its chocolate. The brand was started by Andrew Marten, who suffered from irritable bowel syndrome (IBS) which is a painful medical condition. A good idea paired with research led to the development of the chocolate brand that will help improve the health of your gut. Don’t forget that our gut flora affects how our body functions and even how our skin looks. Each pack of Ohso Chocolate contains eight 13.5 g bars and you can choose from two flavours: Original or Naturally Orange. With no added dairy, each gluten, wheat & nut free individually wrapped bar makes for a perfect snack on the run or a handy treat for a child. Each bar is divided into miniscule squares that you can break off slowly and savour guilt free. Even if you were to twist my arm, I won’t be able to tell you which of the two flavours I like the most. The original bar is loved by my whole family and has a smooth, creamy taste, while the Naturally Orange one has a mellower taste with citrusy sweet undercurrents. When you eat those bars you truly enjoy its chocolatiness, feeling like a connoisseur and not an amateur. 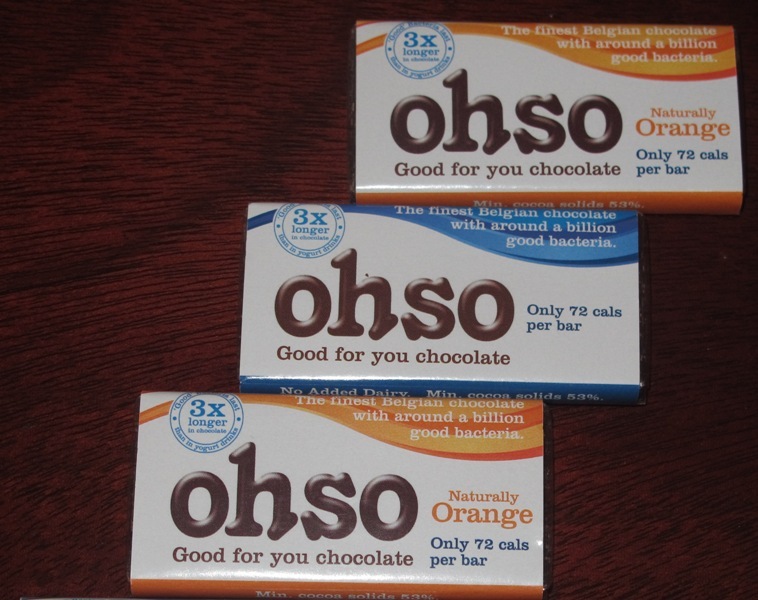 According to Ohso press release, Ohso Chocolate bars are clinically proven to be three times more effective at delivering your daily probiotics than a yogurt or milk drink (based on the survival rates of bacteria passing through the stomach to the small intestine, it was found that the survival rates in the bacteria in yoghurt matrix were three times lover than in chocolate. Source: Ghent University, Belgium). We all lead a hectic lifestyle that puts our digestion under pressure, particularly because many of us are stressed, eating on the run, not chewing properly and in some cases taking antibiotics a few times a year, which kill all the bacteria in out gut. When you finish a course of antibiotics you actually need to take a course of probiotic for a couple of weeks in order to reinstate a perfect gut balance. In Ohso you have a perfect, portable snack that satisfies your sweet tooth while actually doing you some good as well. If you look for convenience factor in terms of delivery, than you can order 7-bar weekly packs via online free home delivery service and have your chocolate delivered to your home or office. Otherwise Ohso can be found at Harvey Nichols Food Halls, Ocado, The Nutri Centre, My Showcase and health food stores and independent retailers nationwide. As a special treat for my readers, you will get your first week’s pack free and the second week’s pack half price by applying the code ”ohsogalina”. Enjoy & let me know what you think of Ohso chocolate! Thank you for your excellent review again. Very interesting to know the story behind a product. I don’t have a sweet tooth but I like a piece of fine dark chocolate some time to time but…. this time I am hooked!! Could it be because it’s smooth and well black with hint of real orange and not the chemical taste of it? I don’t know but if this is good for my gut, skin and whole body as you say I am happy to indulge in it more often ;-). Now since it’s Christmas time I may even order a bunch to distribute to my family in France as it’s milk and gluten free – perfect for them!! As always thank you for sharing your discoveries with such passion!